Antwerp Port Authority has announced the launch of a pilot project for secure and efficient release of containers developed in its innovation network called “Capital of Things”. In close collaboration with the City of Antwerp, the University of Antwerp and IMEC, the Port of Antwerp is developing a unique ecosystem based on the Internet of Things (IoT) that combines training, research, living labs, innovation start-ups in logistics and maritime business, venture capital, corporates and international brands. The Capital of Things ambitious project focuses on five areas that will help to develop the structure of the city and region: the smart city, e-health, the smart port, industry 4.0 and the circular economy. One of the port-related projects within this innovation network is a digital platform for secure, efficient release of containers for collection from the terminal. This was developed by the Antwerp start-up T-Mining and based on a blockchain solution. Thanks to this technology the process which involves various parties (shipping company, haulier, freight forwarder and ship’s agent) can be digitised and made secure. Smart management of the supply chain is an area of the main effort for the Antwerp port community. The Port Authority actively co-operates in this area with NxtPort, the neutral data-sharing platform initiated by a number of leading maritime and logistics companies and industry associations within the port community. 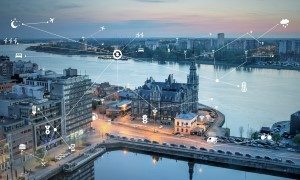 The ambition is to connect all the main assets in the port of Antwerp in real time, offering end-to-end integration with the private port companies in an open ecosystem. Besides, the Port Authority also aims to attract new activities driven by technological developments such as the circular economy, biochemistry and sustainable energy.